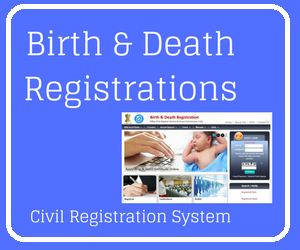 Birth and Death registration of Civil registration System (CRS) in India,The system by which a government records the vital events of its citizens and residents.Civil Registration is a continuous, permanent, compulsory recording of the occurrence and characteristics of vital events, like births, deaths and still births.In India the registration of births and deaths is carried out under provisions of the Registration of Birth and Death (RBD) Act, 1969 and Registrar General, Chief Registrar of Births and Deaths in each States/UTs is the implementing authority and the registration of births and deaths is done by the local registrars appointed by the State Government under whose jurisdiction the event has taken place. It is the duty of the Chief Registrar to compile, publish and submit the Annual Statistical Report based on Civil Registration System to the State Government as well as Registrar General, India.At the National level, about 85.6% of births and 70.9% of deaths are reported to have been registered during 2013.
Who are responsible for reporting the event? In respect of birth or death occurred in a house, it is the duty of the Head of the house/household or nearest relative of the head present in the house or in the absence of any such person, the oldest male person present therin during the said period is responsible to report the event to the concerned Registrar/ sub Registrar. These events can also be reported through the prescribed Notifiers such as Anaganwadi Workers, ANM’s, ASHA’s and others. In respect of birth or death occurred in a hospital, health center, Maternity or nursing home or other such institutions, the medical officer In-charge or any person authorized by him in this behalf is responsible for reporting. Whom to approach for registration? The events of birth and death are registered at the place of occurrence of the event i.e. where the event took place. Under the provision of Section 7 of the RBD Act, the Registrars of Births and Deaths are appointed for each local area comprising the area within the jurisdiction of the Municipality,Panchayat or other local authority. The Sub- Registrars are also appointed under section 7(5) of the Act and assignedthem any or all powers of Registrars. Village Accountants / Village Administrative Officers in 2 States - Karnataka and Tamil Nadu. SHO/Police Officials in Jammu&Kashmir . Primary School Teachers and Head Teacher Primary School in Mizoram and Nagaland respectively. Circle Officer/Village Level Workers in Arunachal Pradesh. As proof of age for employment. For proof of age at marriage. To establish age for purpose of enrollment in Electoral Rolls. To establish age for insurance purposes. For registering in National Population Register (NPR). Production of death certificate for the purpose of inheritance of property and for claiming dues from insurance companies and other companies. What is the time period prescribed for registering the event? How to apply Birth Certificate & Death Certificate registration online ? Enter necessary Details in the registration form. Finally Click on "Register" Button. Note: Only Domiciliary (Home / House) Birth/Death can be reported through this portal within 21 days of the occurence of the event and to the registration unit where portal is being used for Registration of Birth & Death. How to Birth & Death Registered Application Status online ? You can also check registered Birth & Death application Status online, After logon to CRS website in the home Page you'll see " Status of Application" option. If you wants to Check Birth Registration Status,Than click on "Reported Birth" option. Or if you wants to check Death Registration status, Than Click on "Reported Death" option. Now Enter your Reference No. Than Click on "Search" Button. How to Search & Verify Birth/Death Details online ? If you wants to know Registrar Death Details click on "Registered Birth" option.